England international Jack Wilshere has reportedly suffered a fresh ankle injury which could sideline him for the next five weeks at the least. The 26-year-old has struggled with numerous injury concerns over the course of his professional career and his fitness record has witnessed no betterment after joining the Hammers from Arsenal last summer. 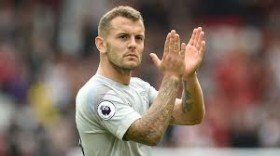 According to The Mirror, the Hammers are likely to be without Wilshere for around five weeks with them concerned that he may require a surgery to rectify his problem. With Wilshere's injury, the east London side remain with just three fit central defenders in the form of Declan Rice, Pedro Obiang and Mark Noble, considering Carlos Sanchez is sidelined for the long-term. Manuel Pellegrini's side are also expected to be without Manuel Lanzini and Andriy Yarmolenko through injuries for the remainder of the season while Marko Arnautovic has been ruled out until the New Year with a hamstring issue.